I’m starting something a little bit different today…a short series of blog posts covering the one, more involved, make. I’ve come back to my sewing table really craving a longer-term project. I’ve reached the point, I think, whereas to curb getting jaded, I need to push myself out of my safety zone and learn some new techniques. I want to invest the time to sew a garment that I should be able to wear for years; a project to breathe new life into my sewing bones, if you will. So what did I decide upon? Never mind that the sun has been beating down and ‘cracking the slabs’ these past few weeks, what I want to sew … is a coat. One of my 2018 Make Nine, to be exact, the Deer & Doe Luzerne Trench Coat. This short series then is about sharing the whole process of making this coat in, more or less, ‘real time’… I admit, when I scroll through my Instagram feed or read a shorter blog post, I’m sometimes left feeling a bit, well, inept. Bombarding myself with images of shiny, new and often very impressive creations, I find it too easy to forget that the Maker probably swore in frustration as often as I do when stitching it together. So, in the interests of showing the sweaty, sweary reality of making my own clothes, I’m going to blog about sewing this coat over the space of, well, however long it takes me to sew it up. (Or, eek, fail and chuck it in the bin!) 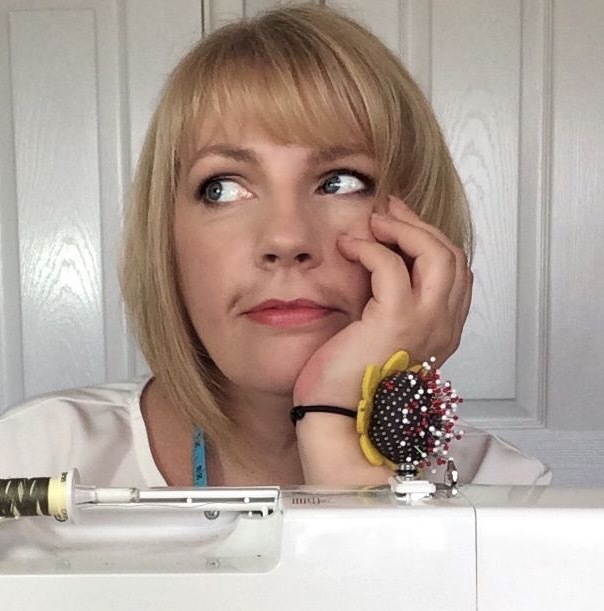 Either way, I thought it might be interesting to show how Sewing fits in my life; the thought processes, doubts and, hopefully, the highs that go into sewing my wardrobe, as well as discussing the construction of the garment itself. I’m not quite sure if I’m intending this as a sort of ‘sewalong’ or simply as a ‘please-hold-my-hand-along’! Day 1 of making my Deer & Doe ‘Luzerne’ Trench Coat. Close-fitting, unlined, double-breasted Trench Coat with princess seams. Pleats at the front and back, diagonal welt pockets and two-piece sleeves. So it features several elements I’ve never attempted before; the bound buttonholes, the two piece sleeves and the need for properly invisible blind (by hand) hemming. All the inner seams of this coat are bound with bias binding and it occurs to me that the large facing piece is going to need some pretty accurate stitching since it needs to match up exactly with the placement of the bound buttonholes it faces. I’ve sewn a Deer & Doe pattern before (their Melilot shirt, see here) so I know their instructions can be a bit ‘succinct’ and I was wary as to how sparse their instructions would be on a pattern they deem ‘Advanced’. However, the read through reassures me they seem clear enough (but I guess the real test is when the garment is in your hands and you’re trying to put it together isn’t it!) Right now though, I’m feeling pretty confident. I go ahead and order fabrics and notions. The pattern calls for ‘light to medium weight twill or gabardine, coated fabric’. Consulting my trusty little ‘The Fabric Selector’ Book, it says twill fabrics are any fabric created with a twill weave, e.g. chino, denim, gabardine and tweed that has parallel diagonal ribs (the wale) in the fabric to produce a fabric which is sturdy, durable and drapes well, with the right, most attractive, side having the most pronounced wale. It is made from a variety of fibres but with cotton and wool favoured. The book also says to use a Universal H, size 80/12 needle. Checked the stash, I’ve got some Schmetz 70.5 H.
The pattern also calls for 11 yards of bias tape. I order 12 metres of this ready-made matching polka dot because I’m a pessimist…or a realist, depending on how you look at it! I also need nine ¾” to 7/8” buttons (so I order 10; good to have a spare eh!) and one ¾” to 7/8” flat button. I’ve chosen these Impex Variegated buttons as I like their lighter blue highlight. I order two spools of matching thread (Gutterman 711). I check the stash and, yes, I’ve enough black woven iron on interfacing. Cool banana. I think I’m good to go! A quick check of the clock tells me I’ve got a few hours before needing to leave to pick the kids up from school. The house could do with a vacuum and the wash basket’s nearly to the top but I want to trace out the pattern. I ponder the complexities of this for a nano-second before deciding the housework can wait, I really, really need to trace out this pattern whilst my brain still functions. The housework can wait till the kids are in bed and my brain has shut down for the night! And you do need to trace out this pattern whether you want to or not as some of the pieces are overlaid. I decide to double-trace certain pieces; you need to cut out four in fabric of Pattern piece 3, for example, so I traced the pattern piece twice, figuring when it comes to cutting out, it will be less hassle being able to lay and pin all my pieces out at once. I also traced out all my notches as outer triangles in case the fabric frays a lot in the handling, making it less likely I’ll ‘lose’ them. I also decide to size up as it’s described as a close-fitting and I would like the option of wearing something thicker underneath it. Ok, ok. I’m heavier than I want to be! I figure if it fits me now it will still be wearable when I’ve shed the lbs. And there’s a gazillion pattern pieces. Alright, there’s not actually a gazillion but I admit to nearly losing the will to live by the end. I’m tracing on the dining table which means I’m bending lower than my back likes. And it’s telling me, loudly, by the time I’ve finished. With only 5 mins to go, I pack everything out the way, chuck the tissue paper scraps that are littering the floor like the aftermath of a wedding into the bin and gulp down the last of my, by now cold, coffee. A quick panic trying to locate my car keys and I bomb out the door to pick the kids up. I’ve got my pattern traced out; I’ve got supplies on their way and I’m all fired up – this is the most excited about a sewing project I’ve been…ever, I think. This excitement means I’m borderline insensible though! I realise en-route to the school that I’ve forgot to order topstitching thread…so rather than take the sensible view that I’m in no real hurry as I wait the delivery of the fabric, I impulsively take a quick detour to the haberdashers and pick up a spool in the only dark shade of blue they have (Gutterman 310). Consequently I make it to the school gates by the skin of my teeth a lot sweatier than I would otherwise have been! So see you back here for Day 2 if I promise to shower in the meantime!? Sewcialise with me on Instagram here! Love the insight into your process – a lot of this sounds very familiar. Hope the topstitching thread matches! Ooo! This is exciting, and what a great idea! Are you making a toile? Please do, because I’ve found that Deer and Doe patterns are short in the body – ie, their bodice length fits me perfectly, and I’m the smallest person I know. I always have to shorten bodices! Good luck!! Loved this post Sarah. It’s really fun seeing the real life behind a sewing project and interesting to see other people’s process. The double tracing of pattern pieces is a great idea. Looking forward to reading the rest of your progress posts. What a great idea. I’ll be looking out for your posts with interest. This is one of the coats that’s on my radiator as a possible for making, although I’m thinking of tackling the Lupin jacket first. Looking forward to the rest with interest! This is fun! It’s going to be beautiful!